This luxurious hotel offers free parking and is just 2 km from Dubai International Airport. It is close to Dubai Creek and the Festival Marina. 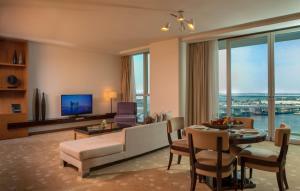 Residence Suite Dubai Festival City provides spacious suites with LCD TVs and offers panoramic views of Dubai Creek. Intercontinental Residence Suites is just minutes away from the Festival City shopping centre and Dubai Festival City. The hotel is also near excellent public transport facilities. Dubai Festival City Mall, with over 500 retail stores including the unique Robinsons, and home to the record breaking IMAGINE water, laser & fire spectacle. InterContinental Residence Suites offers a range of modern amenities, including a swimming pool. 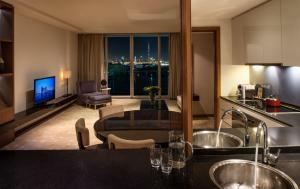 A spacious, air-conditioned suite overlooks the Dubai's skyline. It offers a living room with a flat-screen TV and an iPod docking station. Stay connected with high-speed broadband. The kitchen facilities include a microwave and dishwasher. Extra spacious, air-conditioned suite that includes balcony overlooking Dubai's Skyline. It offers a living room with 2 flat-screen TVs and a DVD player. The Kitchen has a fridge, a microwave and a dishwasher. This studio features a balcony with city or creek views. It includes a seating area with a 37-inch flat-screen satellite TV, a washing machine, and a bathroom with free toiletries. The studio has a microwave, and a fridge. It also has high-speed internet. This suite features a king-sized bed, a spacious living room with a flat-screen TV and a high-speed internet. This room offers a king-sized bedroom, a 37-inch flat-screen TV and a high-speed internet. It also features a city or creek view. Offering views of the city view, this suite features a king-sized bed, a spacious living room with a flat-screen TV and a high-speed internet. Offering views of the Dubai Creek, this suite features a king-sized bed, a spacious living room with a flat-screen TV and a high-speed internet. Offering panoramic views, this suite offers a living room with a flat-screen TV and an iPod docking station. Stay connected with high-speed broadband. Featuring panoramic views, this air-conditioned suite offers a living room with a flat-screen TV. Stay connected with high-speed broadband or relax with an iPod docking station. Featuring panoramic Creek views, this air-conditioned suite offers a king-sized bed, a living room with a flat-screen TV. Stay connected with high-speed broadband or relax with an iPod docking station.